This favorite recipe is a ladies luncheon pleaser! I can’t believe I haven’t thought to share it here before now. I made a batch tonight to accompany my mother’s 73rd birthday lunch here at my house tomorrow! It’s a famous lunch item at our local 1850’s restaurant and one that I make each June for our homeschool mom’s luncheon. Someone always requests the recipe. In separate bowl combine dressing ingredients. Stir dressing into chicken mixture. I cook a whole chicken in about two cups worth of broth in my crockpot for five hours on high…the meat is so tender and tasty that way. This salad is also delicious accompanied by my mom’s croissant recipe! Hope you try it–it’s practically too easy to make considering how fantastic it looks and tastes! ETA: I added pictures! 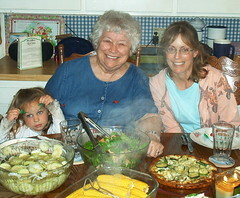 The three lovelies in the photo here are my 4 year old, my mother–the birthday girl!, and my sister! This recipe looks similar to the one we use for special occasions! Mary, how many will this recipe feed? I might use it on Sunday for company! I’m also like Colleen only due to age restriction etc. it is the only way I fix it. I’ve never put the fruit or chestnuts in it but otherwise everything but the kitchen sink. In particular mixed frozen oriental veggies (because I love them). Then I freeze portions for my occasional meal. By myself this works well. Aunt Ruth, I added a people pic just for you! We had a great time, and my oldest brother even got involved from the west coast by having flowers delivered out to my country home just for mom! What a nice surprise! Holly, we usually have ten ladies at the homeschool luncheon and there’s always enough leftover to feed several more (and usually people go up for seconds. I had a lot leftover today as well, but we had a lot of side dishes. It probably would stretch to serve 18 if you had several side dishes. In the first picture above, it’s the dish right next to the corn. It doesn’t look very big, but it’s heaped full, and I still had a cup leftover in the refrigerator that wouldn’t fit in the bowl. HTHs! I agree I made it once for a work appreciation lunch and everyone raved about it. SR and I were talking about spicing up our brown bag lunches with either chicken salad or egg salad! My mouth is already watering! This sounds DELICIOUS! I have to do a company lunch this weekend, and I’ll keep this recipe in mind! Yum, if you have a good egg salad recipe, Colleen, please post it sometime…I need one! So glad to share it, Beck! Hope you try it and that it becomes a fave! All I can say is yummmmmmm!!! !